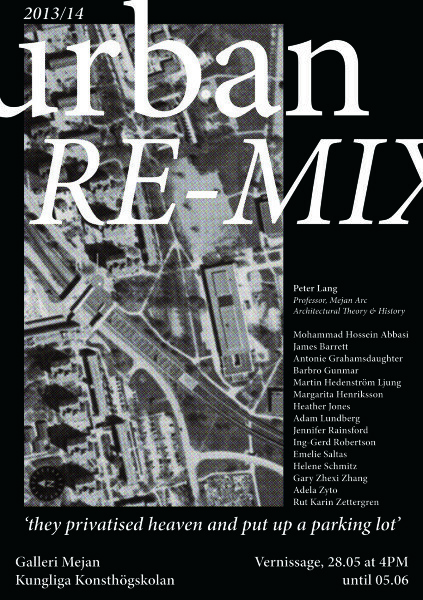 Urban Re-Mix: the inauguration 28 May, at Mejan Galleri. As the new professor at Mejan Arc introducing for the first time at KKH a course in Architecture Theory and History I am committed to developing a program focusing on advanced research, public events and related urban, architecture and design projects that are capable of questioning current educational practices and the profession at large. This vision recognises the role of advanced research in connecting the past to the present, as well as the role of communications and media in formulating open public discourse. If history can be read like a concept—paraphrasing from Fredric Jameson—then theory can suggest a practice. As part of my vision for the course, I am extremely interested in developing research objectives that bring the Architecture program closer into the sphere of the KKH Art program, opening up to greater exchanges and experimentation among the disciplines. I have encouraged students in the course to explore in their individual urban, architecture and design research projects across a range of experimental productions and creative expressions, using the Institute’s excellent facilities, its wood, plastic and metal shops, 3D printing labs, graphic departments, and video and electronic labs. The student projects presented for the final review, on exhibit at Mejan Galleri, reflect both their individual research on a series of case-studies together with innovative production and communication values. These projects examine a broad array of places, including the faraway islands of Hawaii the remote regions of Pennsylvania, to nearby districts like Blasieholmshamen or Tensta. For the first year here at KKH, I think it important to put these works on display.